At the northern end of Sendai Bay, Ishinomaki once boasted one of the world’s largest fish markets. On March 11, 2011, the earthquake and tsunami destroyed about 28,000 of the port city’s houses. More than 3,000 residents perished, and nearly three months later, almost as many people remained missing. 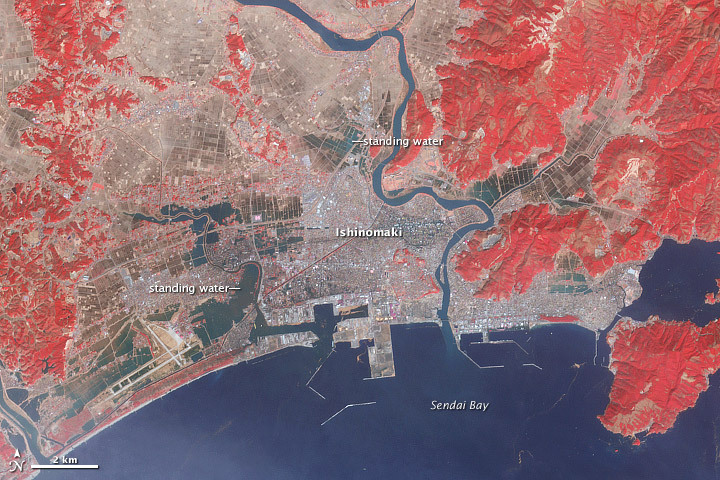 These false-color images compare conditions in Ishinomaki immediately after the earthquake and tsunami, and then a year later. 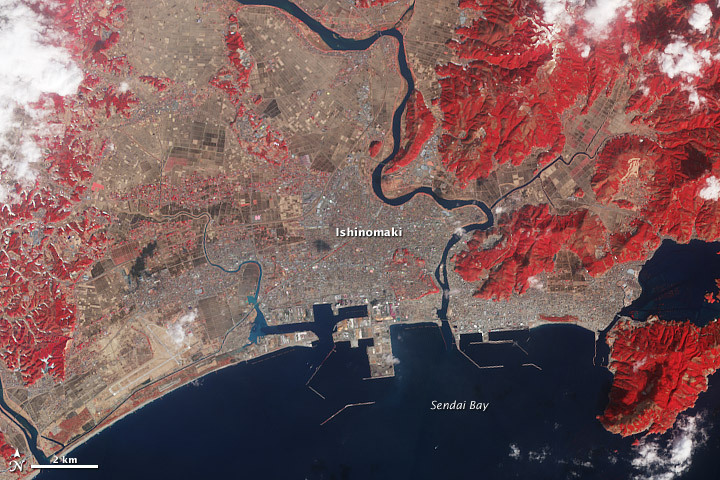 The top image, acquired by the Advanced Land Imager (ALI) on NASA’s Earth Observing-1 (EO-1) satellite, shows Ishinomaki on February 21, 2012. 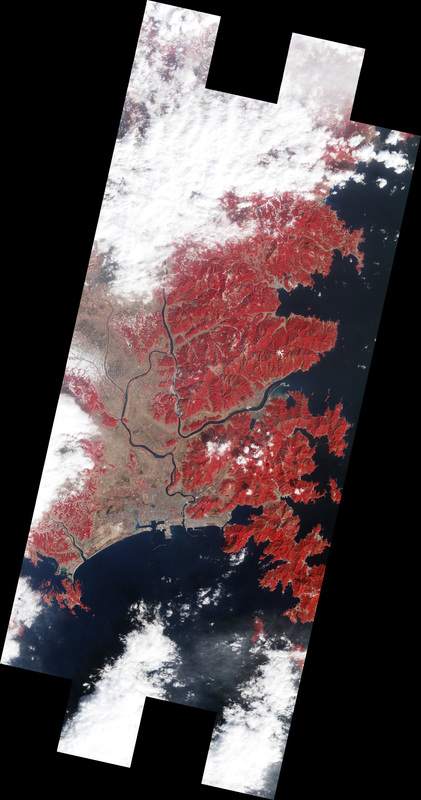 The bottom image, acquired by the Advanced Spaceborne Thermal Emission and Reflection Radiometer (ASTER) on NASA’s Terra satellite, shows the same area on March 14, 2011. 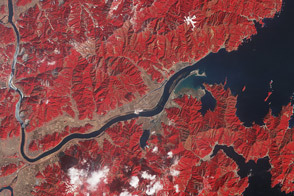 In these false-color images, water is blue, vegetation is red, and bare ground and urban areas range from blue-gray to pink-beige. Ishinomaki is a mixture of agricultural fields, homes, and businesses. Along the coast lies the Matsushima Air Field, identifiable by its runways. The Old Kitakami River snakes through the region, draining into Sendai Bay east of the city center. The biggest difference between these images is the retreat of flood water. In March 2011, standing water swamps fields on both sides of the river, and north of the airfield. Eleven months later, the water has retreated. Although Ishinomaki dried out in the year following the tsunami, it hardly returned to normal. 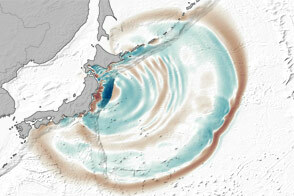 The coastal plain along Sendai Bay experienced some of the farthest-reaching tsunami waters. Both low-lying and heavily urbanized, Ishinomaki was one of the hardest hit by the March 2011 event. Having experienced several tsunamis in recorded history, Japan is better-prepared for such events than perhaps any other country. Sea walls and breakwaters line almost half of Japan’s coastline, and they could counter the roughly 4-meter (13-foot) walls of water from the kind of tsunami that strikes every 150 years or so. 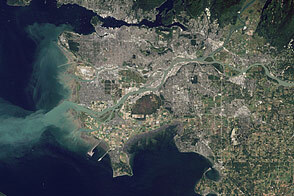 But the March 2011 earthquake sent a 20-meter (65-foot) wall of water to the city. Coastal forests that were planted to provide protection from the sea were instead transformed by the potent waves into thousands of battering rams. A year after the earthquake and tsunami, rebuilding Japan’s coastal cities to withstand tsunamis remains a challenge. See other images from the tsunami—including more imagery from 2012—in our feature slideshow: Tohoku Earthquake and Tsunami: Looking Back from Space. 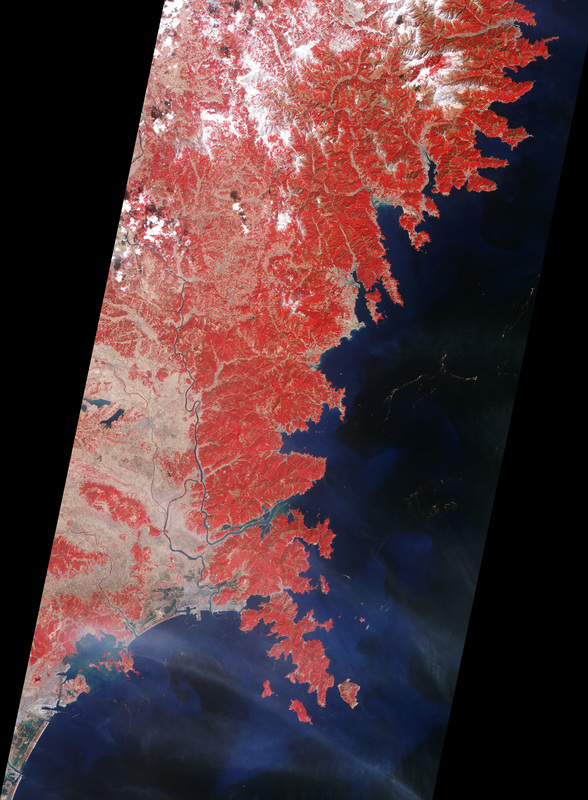 NASA images by Jesse Allen and Robert Simmon, using ALI data from the EO-1 team, and data from the NASA/GSFC/METI/ERSDAC/JAROS, and U.S./Japan ASTER Science Team. Caption by Michon Scott. Acquired in mid-March 2011, and late February 2012, these images document the recession of flood waters from Ishinomaki, Japan. On March 11, 2011, a magnitude 9.0 earthquake struck off the east coast of Japan, triggering a large tsunami across the Pacific Ocean and inundating Japan's coast. Cyranoski, D. (2012, March 8). Rebuilding Japan: After the deluge. Nature, 483, 141–143. Martin, A., Aoki, M. (2011, April 1). Tsunami-ravaged Ishinomaki slowly sets off on long road to recovery. The Japan Times. Accessed March 8, 2012. Miyazawa, H. (2011, May 25). Land use and tsunami damage in Pacific Coast region of Tohoku District. The 2011 East Japan Earthquake Bulletin of the Tohoku Geographic Association. Accessed March 8, 2012. Werman, M. (2011, May 31). Japanese city tries to recover from tsunami. Public Radio International – The World. Accessed March 8, 2012.